mailparser.io allows you to process incoming emails and convert them to a data format which better fits your needs. Use mailparser.io to extract leads, order information, tracking-numbers or any other kind of data hidden inside your emails. 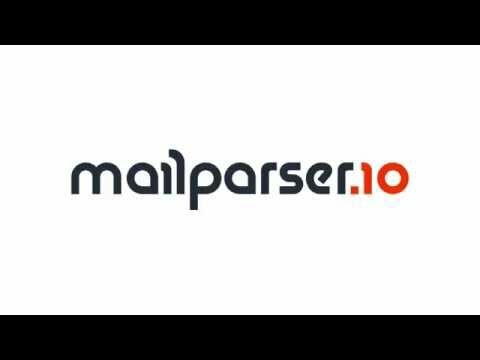 mailparser.io can process any kind of recurring email (e.g. order receipt, emails from contact forms, etc.). mailparser.io automatically converts your emails into easy to handle Excel and CSV spread sheet files. It's also easy to connect mailparser.io to other webservices (e.g. CRM, Mailing List, your own script) by using HTTP webhooks. Extract information from multiple lead channels to push into our CRM.Mailparser is really easy to use if you understand basic logic. It seems like any rule I thought of I could apply to parse out the info I needed. We use this for multiple lead channels and have been able to find rules that fit all of them. I highly recommend giving this a try if you find yourself needing to extract information from email. Mailparser is really easy to use if you understand basic logic. It seems like any rule I thought of I could apply to parse out the info I needed. We use this for multiple lead channels and have been able to find rules that fit all of them. I highly recommend giving this a try if you find yourself needing to extract information from email. Loading between different inboxes and pages within the inbox can take a bit. Also, there's one bug with the logic that allows you to prevent emails from hitting your inbox. If this was fixed we could eliminate a lot more junk leads. Hi Matt, and thank you for your review. We are glad to hear that you are enjoying our email parser software. We've also noted your advanced filtering request to our dev team "for future consideration" in our ongoing feature upgrade sprints. Please reach out if you ever need anything. We estimate that Mail Parser saves us 10+ labor hours per week. Over the course of a year, this software pays for itself many times over. Additionally, using this data parsing solution essentially brings input accuracy to 100%. This eliminates the cost of data errors, which can be significant when dealing with data types such as email addresses and phone numbers.We love Mail Parser because we have a significant amount of data that comes to us in the form of emails. We need to extract this data and format it in a very specific way in order to import it into our systems. Mail Parser makes this process extremely easy and very efficient. We love Mail Parser because we have a significant amount of data that comes to us in the form of emails. We need to extract this data and format it in a very specific way in order to import it into our systems. Mail Parser makes this process extremely easy and very efficient. We have no complaints or problems with the software. We appreciate your feedback Max! You have really highlighted a few of our core strengths (time saved, and accuracy). Please reach out if you want to discuss other areas of your business that might benefit from our email parser platform. I have used it in Zaps to automate lead data entry, solicit customer reviews, and more. I can achieve these automations much more affordably with Mailparser.io than I can with competing single purpose solutions.It is the most capable mail parser available. When paired with a service like Zapier it facilitates all kinds of interesting automation. It is the most capable mail parser available. When paired with a service like Zapier it facilitates all kinds of interesting automation. While overall it is easy-to-use, it can be a bit complicated to noodle through the best logic to apply to get the final result you desire. I have found their support team to be helpful and responsive when I run into questions though. Thank you for taking a few minutes to share your thoughts on Mailparser. Great to hear that you are coupling our product with Zapier. That is a very popular path for clients. Microsoft Flow is another integration platform that users are taking advantage of too. We have many different business problems that we solve with Mailparser. Overall the company is great to work with and produces quality upgrades (ie. it doesn't break when they release new features! ).Easy to use, easy to map fields, very scalable too! Love that it integrates with connectors in our software. Allows us to keep API keys private where we need mass people to submit structured data into a database. Super great product and just as good customer service. Easy to use, easy to map fields, very scalable too! Love that it integrates with connectors in our software. Allows us to keep API keys private where we need mass people to submit structured data into a database. Super great product and just as good customer service. Thanks a lot for your review Kendall, we're thrilled to be a cog in your business. If you eventually do think of something you don't like please let us know so we can fix it! It's an invaluable tool for internet marketers working in the marketing automation space. Easy to use and set up. I use it everywhere, even if not a requirement, to create backups of data. The ability to turn emails into structured data and capture that data in a Google Sheet as a backup is great! UI could use a refresh. Also some features were not there, but the they have been very responsive in listening to user feedback and adding things as they can. Start a 30-free trial today. No obligations attached, no credit card needed. The monthly plans are based on the quantity of emails processed by month. How does mailparser.io compare with other Communications apps? I like that the software does exactly what it's supposed to. It's not the flashiest interface in the world, but it has everything necessary to get the job done (automating inbound data / leads). Ability to parse content from specific types of document attachments. Can isolate the path to the attachments (documents and photos). Easy to follow parsing logic. Great support. Customized inbox rules (allows user to block or permit certain emails). Webhook integration to Zapier and others. Pricing. I feel like the packages are too spread out in terms of value recieved, whereas if they had a few more price points they would probably have more customers. Functionally, none that I can think of. Can get expensive compared to other parsing solutions, especially if you don't need support for attachments - there are others that do this for much less per month. Automate your email workflow and save valuable time. Below are some frequently asked questions for mailparser.io. Q. What type of pricing plans does mailparser.io offer? Q. Who are the typical users of mailparser.io? Q. What languages does mailparser.io support? Q. Does mailparser.io support mobile devices? Q. Does mailparser.io offer an API? Yes, mailparser.io has an API available for use. Q. What other apps does mailparser.io integrate with? Q. What level of support does mailparser.io offer?